Nurdles Are The New Plastic Waste Issue | HOBI International, Inc.
Have you ever heard of nurdles? You probably haven’t, but they’re just about everywhere you turn. Nurdles are tiny pellets of plastic resin no bigger than a pencil eraser that manufacturers transform into plastic packaging, plastic straws, disposable water bottles and other typical targets of environmental action. They also just happen to be the latest threat to our planet. 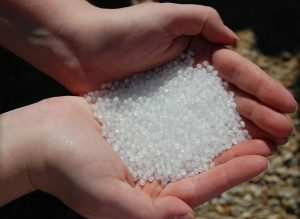 Each year, billions of these tiny plastic pellets get lost in production and through the supply chain process. Oftentimes, and very unfortunately, these pellets end up washing into our waterways – which not only contaminates our water sources but disrupts the ecosystem and animal inhabitants of these areas. The entire planet is going through a plastic waste crisis due to material such as nurdles. And for the U.K., nurdles are rapidly becoming a huge issue – an environmental consultancy estimated that pre-production plastic pellets are the second largest source of micro-plastic pollution in water, after micro-fragments from vehicle tires. Currently, there is limited information on the extent of this kind of plastic pollution by U.S. companies and global researchers have struggled to even attempt an accurate assessment due to the rate at which plastic production and use is rapidly moving. However, there is indication that leads researchers to believe that it is a significant amount of plastic waste each year. A 2018 study estimated that anywhere between three million to 36 million pellets escape every year from a single, small industrial area in Sweden. So just imagine the amount of material that escapes from larger facilities throughout the U.S. and other countries. We’re truly living in a world that is drowning in plastic waste. Further research has revealed the ubiquity of these nurdles in the bellies of fish caught in the South Pacific, to the digestive tracts of short-tailed albatross in the north and on the beaches of the Mediterranean. Now, shareholder advocacy group As You Sow has filed resolutions with Chevron Corp., DowDupont Inc., Exxon Mobil Corp. and Phillips 66 asking them to disclose how many nurdles escape their production process each year, and how effectively they’re addressing the issue. A spokesperson for each company mentioned above have said that shareholders are continuing to meet in order to find sustainability efforts. The companies will decide in the next several months whether to include the resolutions in this year’s proxy statements, according to As You Sow.